Capital of Jefferson county, Alabama, founded in 1871. The first congregation, Emanu-El, was organized in 1882; the corner-stone of its building being laid in July, 1886, and the building dedicated in 1889. The rabbis of the congregation have been: Alexander Rosenspitz, 1885; Maurice Eisenberg, 1886-90; Samuel Ullman, 1891-94; David Marx, 1894-95; Morris Newfield, 1895-. 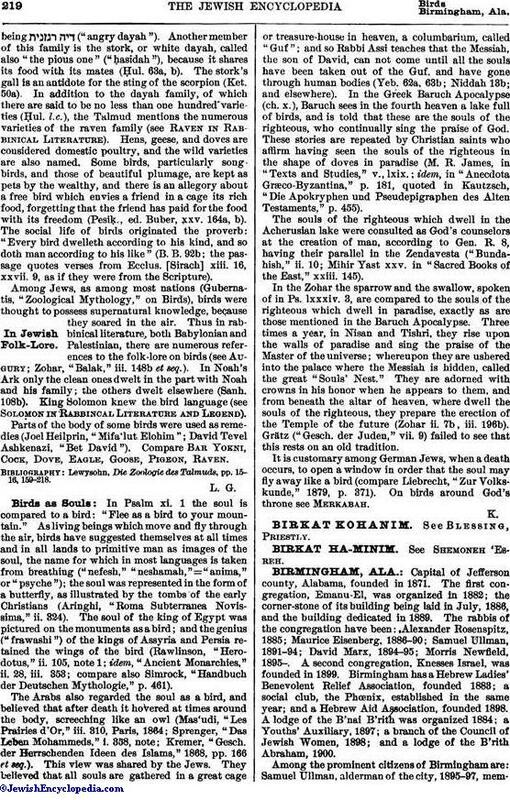 A second congregation, Knesses Israel, was founded in 1899. Birmingham has a Hebrew Ladies' Benevolent Relief Association, founded 1883; a social club, the Phœnix, established in the same year; and a Hebrew Aid Association, founded 1898. A lodge of the B'nai B'rith was organized 1884; a Youths' Auxiliary, 1897; a branch of the Council of Jewish Women, 1898; and a lodge of the B'rith Abraham, 1900. Among the prominent citizens of Birmingham are: Samuel Ullman, alderman of the city, 1895-97, memberof the board of education since 1884, and its president since 1893; Benjamin M. Mayer, editor of the "Age Herald"; Emil Leeser, police commissioner, 1897-99, and editor of the Birmingham "Courier" (German); and Simon Klotz, French consul. 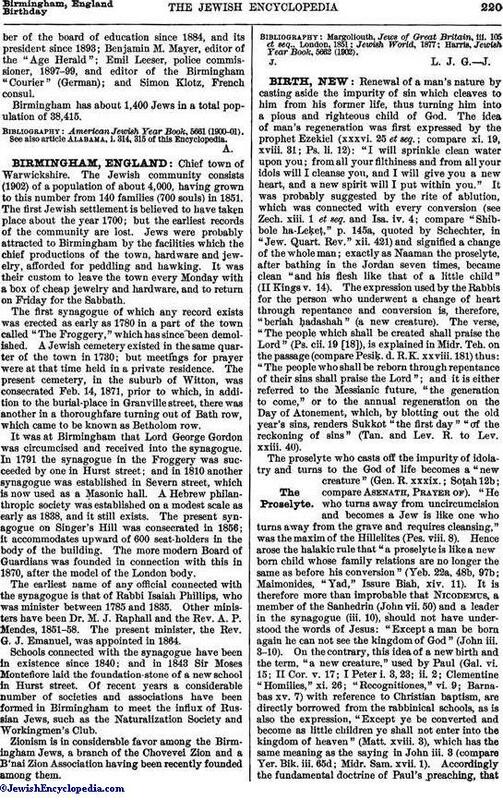 Birmingham has about 1,400 Jews in a total population of 38,415. American Jewish Year Book, 5661 (1900-01). See also article Alabama, i. 314, 315 of this Encyclopedia.